I went to see Hidden Figures with a few of my mentors and I am so grateful to have experienced this movie surrounded by women that I admire and continue to learn from. To be able to discuss the movie with women that lived through this time was a wonderful moment. It’s crazy though that while some of the women I was with could remember the events of the movie happening they had not heard of these women. If you haven’t seen the movie yet please grab a friend and go. If you have a daughter that is old enough to watch more than just cartoons in the theater take her. If you have a son that can sit still for a movie take him. Take someone and go see this movie that is filled with our hidden history. And then after you see the movie tell someone about it. This movie touched me as a woman. It touched me as a Person of Color. It touched me as an American. In a time where the struggle to be all three is so very real this movie reminded me of how far we’ve come and how very far we still have to go. 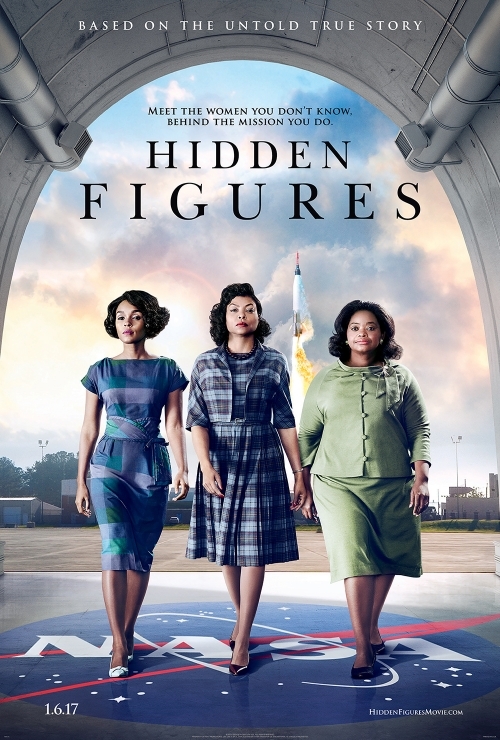 The story is based on the work of three Black women working for NASA whom would each impact history in huge ways even though chances are before this movie was released you didn’t know their names! Mary Jackson, Dorothy Vaughn and Katherine Johnson. Learn their story. Share their story. Support this movie. Next time you hear someone say girls aren’t good at math, coding or engineering use Mary, Dorothy and Katherine as examples of how wrong they really are. Taraji P. Henson, Octavia Spencer and Janelle Monae each do an incredible job becoming the women they portray. The wardrobe in the movie made me want to throw away everything in my closet and raid theirs. The music had me swooning in my seat. Please go see this movie. I need more people to talk about it with. After you see it please tag me on social media so we can discuss how very real many of the fears felt in the movie are still felt today. Let’s talk about the pride we have in the strength and resilience these women showed. My 12 year old went to see it on Friday with his school. I am looking forward to seeing it myself. Saw it recently and absolutely loved it! It was so inspiring!